Stacking rings are a huge trend right now in the fashion world. In fine jewelry, it is a creative way to make a look that’s uniquely you. Stacking rings can be added to your wedding set or worn solo. However you decide to wear it, we have a few tips to style your stack. Don’t think you need to go all bling. A solid band without diamonds or gemstones is sometimes the missing link, er, ring. Create a minimalist stack with a little bit of space and see how the contrast pulls it all together. If you need a little more interest, try a hammered texture or a small design. Adding a channel-set band creates a huge look between two prong-set bands. Want something a bit more contemporary? Try a bezel-set band. Love a good floral motif? Is the infinity trend calling your name? Go for it! Just don’t go crazy with these novel designs. They are sweet in small amounts, but can be overwhelming and chaotic when you try to fit too much into your stack. Don’t feel tied down to round. Adding a ring with fancy-shape stones will create interest, especially if you are staying with one metal color. Look at baguettes (my fave!) or marquise for something special. Adding gemstones to your stack is a great way to make it special. Honor your special someone or your children by using their birthstones in a ring. Keep in mind that different color gems show off in different metal colors. Cannot be sized. 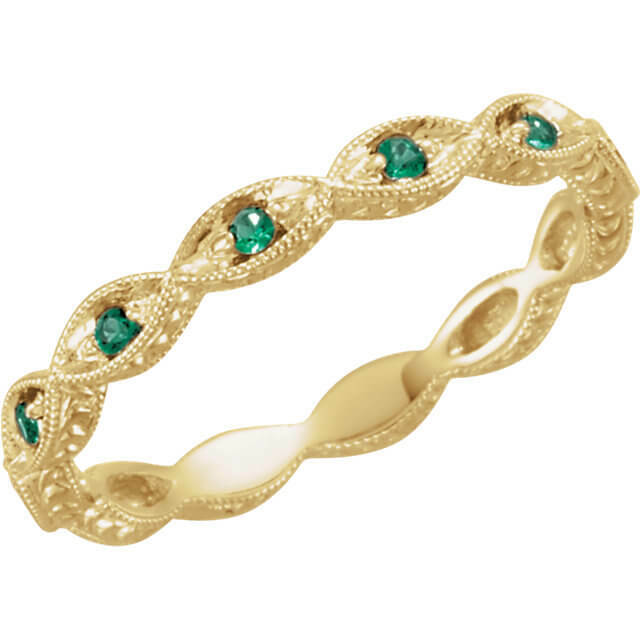 While there are some solutions to make an eternity band fit tighter, they cannot be enlarged or properly sized. Higher risk of damage. With stones all-the-way around the ring, the inside stones (on your palm side) are susceptible to damage. Think about how much you do with your hands. Less economical. This isn’t really a surprise. More stones (especially diamonds) = more money. How durable is this setting? What kind of care and maintenance is involved with this ring? Do you have a favorite stack? Send us a photo on Facebook! Ready to create your own? Visit our online selection or stop by in store to mix-and-match.